We all know that living in the natural world means facing wildlife from time to time. Depending on where you live and what you grow you might have a variety of animals as visitors. Here at the Lakritz Family Farm we try to be prepared for the critters as much as possible. Thankfully we don’t have to worry too much about predators though we do get them from time to time. 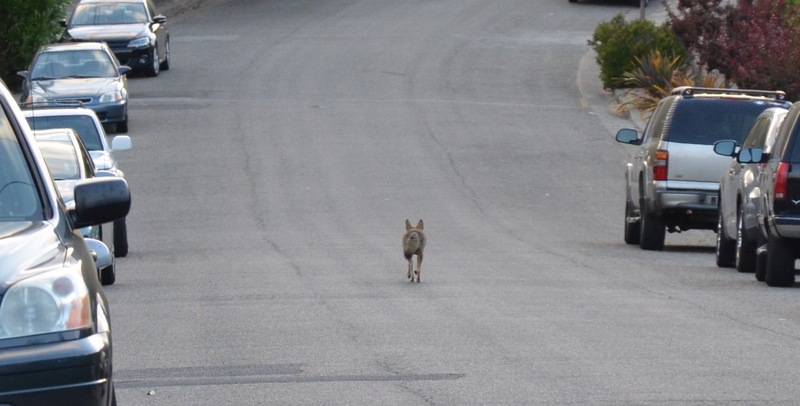 Last month we had a coyote boldly travel through the neighborhood in broad daylight. Our fence keeps this animal off of the farm and it’s probably looking for some meat anyway. This is one of the many reasons we don’t raise chickens. 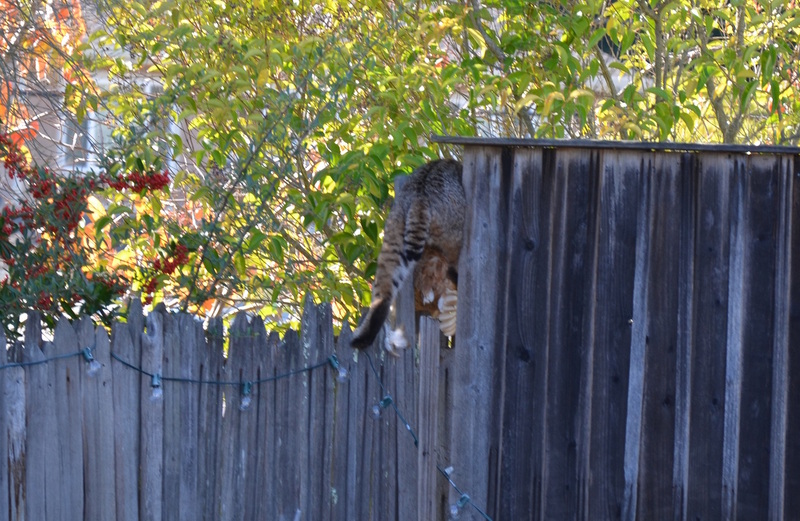 Earlier this year we had a bobcat running through the backyard with a chicken in its mouth. I was able to get a picture as it went over the back fence. If you look closely you will see the feathers of the chicken. The chicken came from our neighbor’s yard. She had let them out of the coop during the day. Here’s another one of the bobcat and coyote’s potential victims. Jack rabbits are pretty common in our area but we usually only see them at night. The hog fencing is good enough to keep this little one out. It prefers the lawn of our next door neighbor anyway. 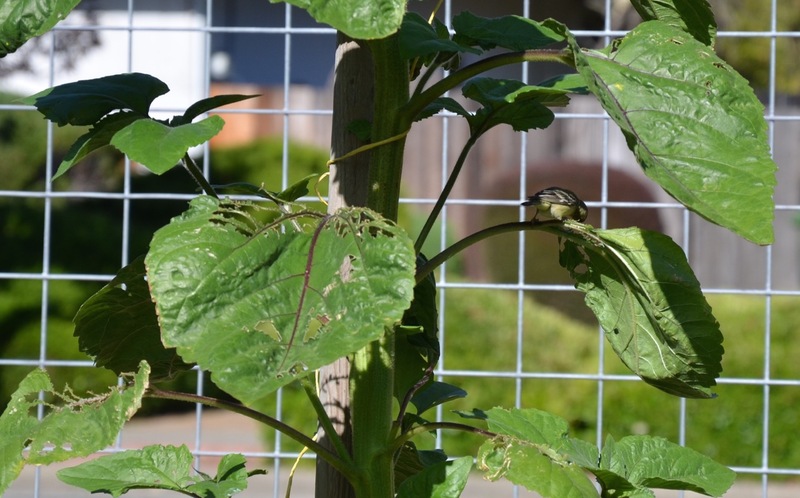 One thing that surprised me this week was seeing birds nibbling on the large leaves of the sunflowers. I’m not exactly sure why they are eating the leaves because we don’t see any bugs on them. Given the deep drought happening in California today my theory is the birds are eating leaves for their water content. We’ve also had crows eating our kale but we were able to slightly cover them with some mesh and they stopped coming in to eat even after we took away the mesh a few weeks later. Thankfully, we’ve had very few serious battles with critters this year. Because of the drought we do expect to have many more encounters with wildlife this summer. This entry was posted in Animals, Crops, Drought, Food, Lakritz Family Farm, Urban Farming, Water, Wildlife and tagged Birds, Bobcats, California, Coyote, Drought, Farming, Food, Jack Rabbit, Predators, Urban Farming. Bookmark the permalink.